But I found the perfect spot to lay my tea. I just found it the other day. hobbit sized person like me! lol! I am still wanting to paint my art room. What about a French blue? 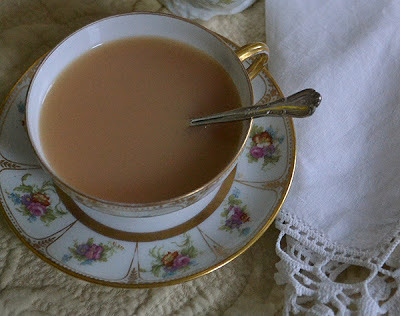 It is so light and thin...tea is delicious in it each and every time. My tea pot this afternoon I found in England while driving to Lymington. She was in a very charming vintage shop on the roadside. I am having delicious and aromatic Assam tea. Cream and sugar enhance it's flavor for me. as well as the delicate spray of flowers. The pictures do not do it's beauty justice. I feel blessed to have her with me. 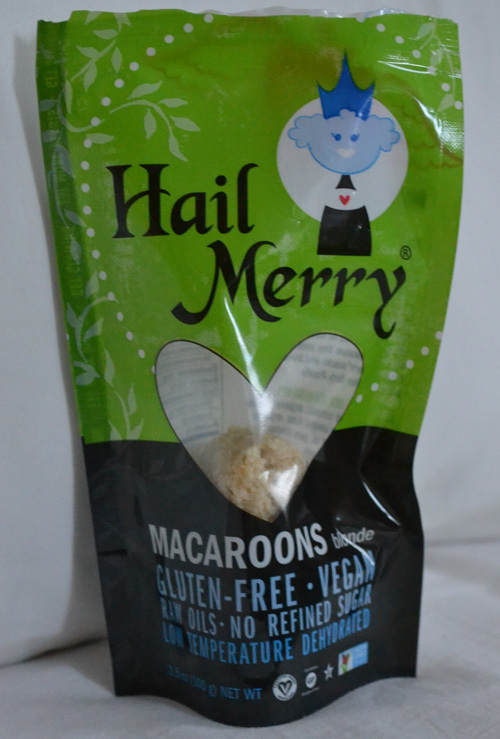 These tasty little cookies from Whole Foods. I was really surprised at how creamy they are. Isn't this an interesting style handle? but I don't know it...do you? 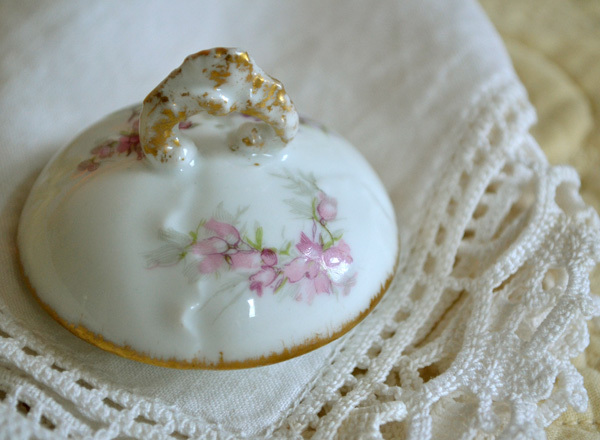 This delicate beauty was created by W. Guerin, in Limoges, France. The closest backstamp I could find was dated 1890-1930. So, she might be a bit old. Isn't this a sweet backstamp? carrying the stick with two banners. No luck yet with dating this backstamp. 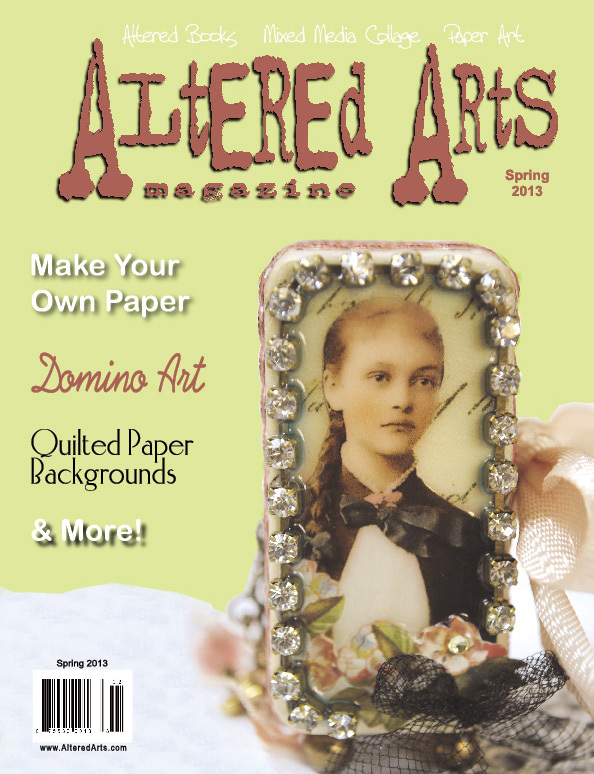 Altered Arts magazine's cover this month. I was very honored to find this out! She looks sweet on there, doesn't she? She is a Paperwhimsy girl image. There are a few pages of my entire book inside. They really did a beautiful job on their Domino Art article. There are many other gorgeous domino books featured. I was very impressed with the beautiful images inside. Did you know I teach a mixed media domino book class at Creative Workshops ? Thank you so much for stopping by on this stormy spring day. I am so glad you did! I hope you are enJOYing life today. with your tea cup in it and then come back here and link up that post below. Then Martha and I can come and see your lovely tea post! 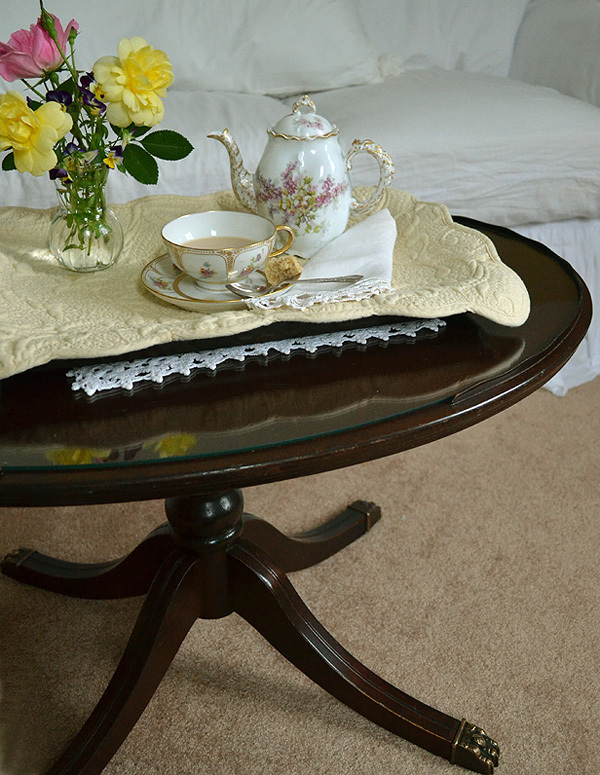 Love the presentation of the tea table. It's elegant and soft. Also the stormy sky as a background of the nearly black and white photo of the window seat creates a great contrast of what is to follow in the later part of the post. 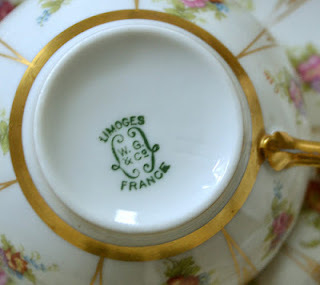 Une très jolie tasse ! ces fleurs sont délicates et belles! Your pictures are really beautiful! 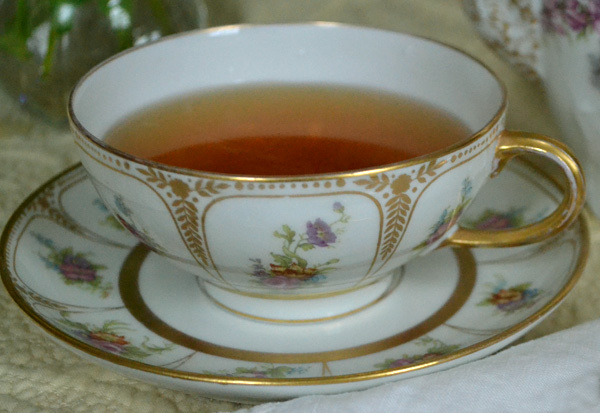 I'm glad to partecipate on yours tea cup on Tuesday. What a lovely tea you have there. So delicate are those pieces and yes, the backstamp birdie is a sweet one. You were cozy with your tea safe from the stormy weather. Congratulations on your feature. I love your pretty new teapot and teacup is gorgeous. You have so many pretty ones. Your photos are fantastic. I love your teacup and your tea pot, so feminine and sweet... The photo with the lid is wonderful. I enjoy your parties a lot, thank you for hosting! After viewing everything that Bernideen has been painting white, your table would look nice either in white or the blue you're thinking of. What a find the teapot is! She is really lovely and the teacup goes so well with her. I like your coffee table. If it was mine I would paint it. I find the details seem to pop more when these pieces are painted. And French blue would be gorgeous in your art room. It is bright and sunny here today and we will welcome it as we have had a very cool Spring so far. Have a happy day. Love, love, love that new coffee pot! It's so sweet and has such detail. Just gorgeous. 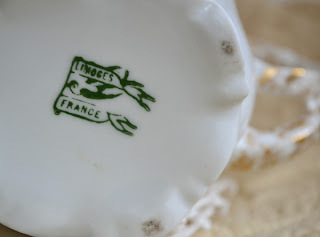 I just love the Limoges teacup! The gold is so striking! Your pretties look gorgeous! Thanks for sharing! That t ea cu p is one of the most beautiful I have ever seen- wow! Have a lovely day, finally stopped raining but already the sun is behind clouds again, so may rain more...hate it, need to get out in the garden and get some work done! oh my, what wonderful treasures you share today. The tea cup and the tea pot are breath taking beautiful - it doesn't surprise me that they are Limoges. This is the kind of weather to sit warm and safe in a room with tea. I love a bit dramatic when it is just from the weather. The cookies look so yummy! Thank you so much for sharing this delightful tea and for hosting this sweet event. P.S. : Your paintings from the last post are really great. Your ARE an artist! My only name for the teapot handle is Beautiful! The sweet little bird is very possibly a swallow, which is one of my favorites. Your window scene is hauntingly gorgeous. I see gluten free on your delicious little cookie and that's what we must have here, since my husband cannot have gluten. Good find. Congratulations on the cover picture of the magazine. I am going to go see that article now. It stands to reason that yours would be the cover. Your sense of beauty is limitless. As for the table, either way is beautiful. Hello Terri, We've had stormy weather of late - and cooler. I have enjoyed the soft rain and the glimpses of the sun. Your tea looks quite lovely - I like the table's dark contrast to your light couch - but, am not adverse to paintedfurniture! 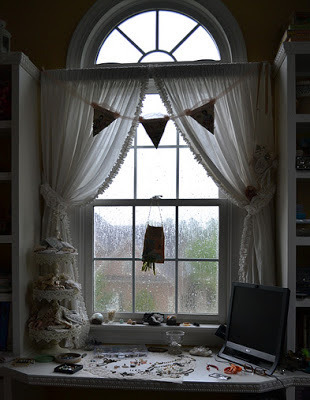 So cosy having tea inside your lovely home, while the sky is turning black, and water falls from above! The sweet beautiful tea cup looks so lovely with your tea with milk- and the tea pot is wonderful- a pretty piece to bring home from your travel my dear Terri. Hope you have nice weather again...here we could use some water for the rose busches!! Congratulations on your Altered Domino Book article. Your class is wonderful, and I recommend it to everyone. Terri, A huge hug and huge Congrat's on the cover of the Altered Arts magazine, that is FANTASTIC!!! Such an honor and you are so deserving, that class is fantastic, you are fantastic! I have to get this! 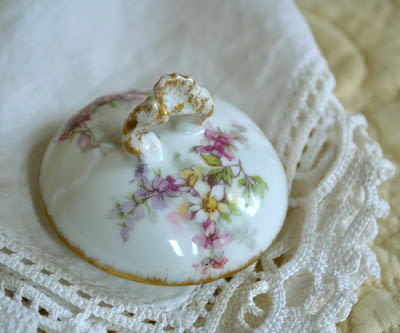 Your tea set look so gorgeous, I love the lid also. I so wish I was sitting there with you....someday for sure! Hugs! pâle , le jaune " Money "
Congratulations on being in the magazine! I somehow managed to delete my thumbnail as I entered my link. You can delete the link and I can come back later and add it in. 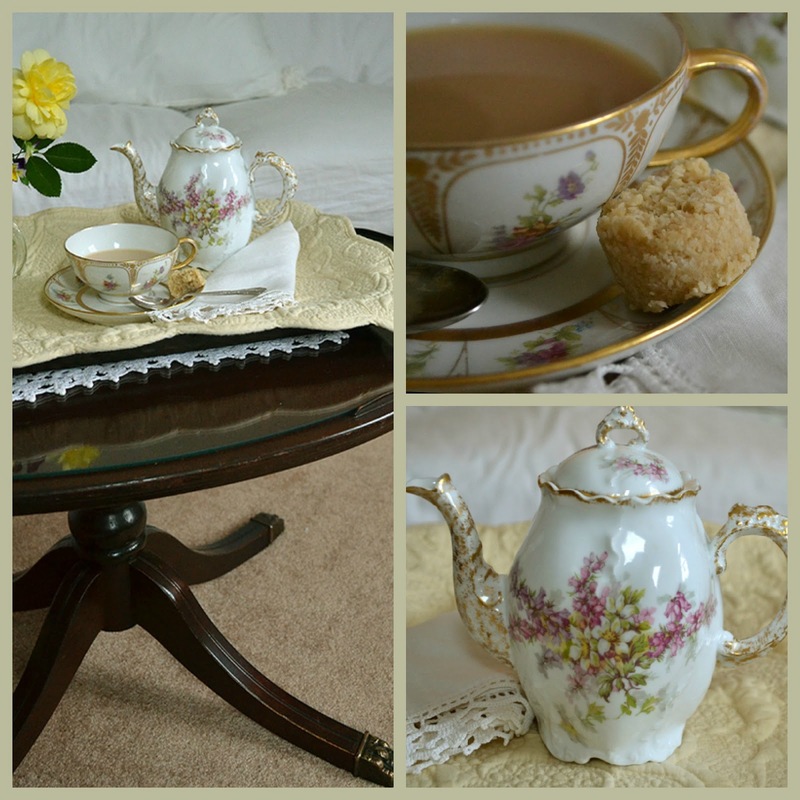 I love how you set the mood to your tea time today! So mysterious! 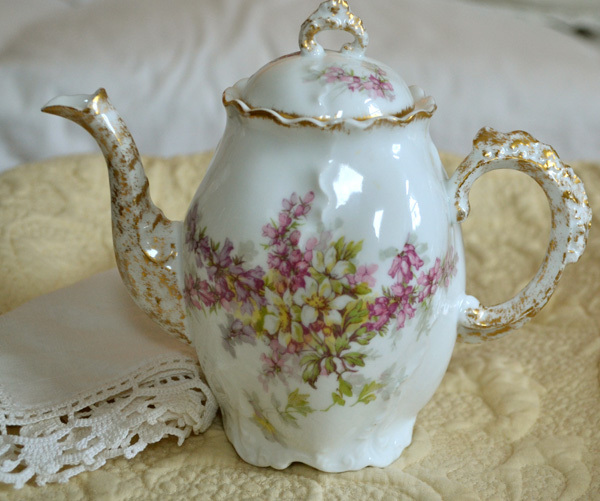 Your teapot is gorgeous. love it! I would paint your table a pretty color. Thanks for hosting. First of all congrats on being a cover girl!! I didn't know this mag even existed any longer-at least it's not sold around here anymore. Lovely presentation despite the stormy weather outdoors. I'd def. not stain or paint the table-I love the dark richness of it especially against all your pretty creamy things! Hi--I love your posts, Terri! 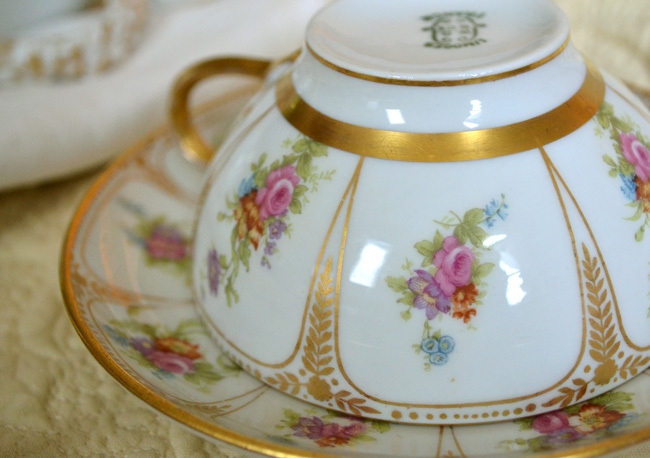 The teacup and saucer are both beautiful--and that table! What a find! I would leave it just as it is--it's wonderful! As far as the paint in the room goes, French Blue sounds so pretty. Enjoy the storm and stay safe and cozy! Congratulations on the cover! That is well deserved. I love a cozy cup of anything hot when it's thundery. It's so nice! Don't you hate when you want to make some kind of change but there are too many possibilities? Then you hesitate. But I'm sure you'll figure out the perfect color. 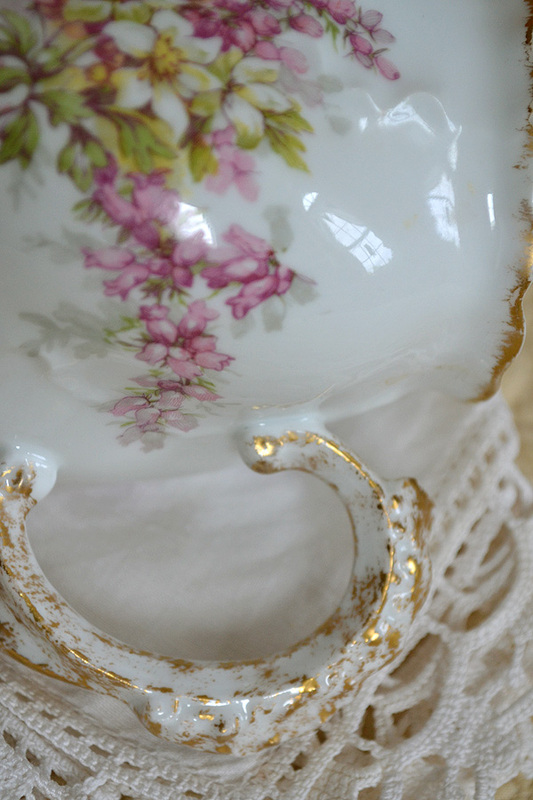 The first thing I thought of when I saw the tea cup was how cool it is that the gold on the handle is rubbed off some. It was well used, meaning well loved in my book! Beautiful images as always and so serene. We've had so much rain lately and our first spring thunderstorm on Tuesday evening. Buckets of water! 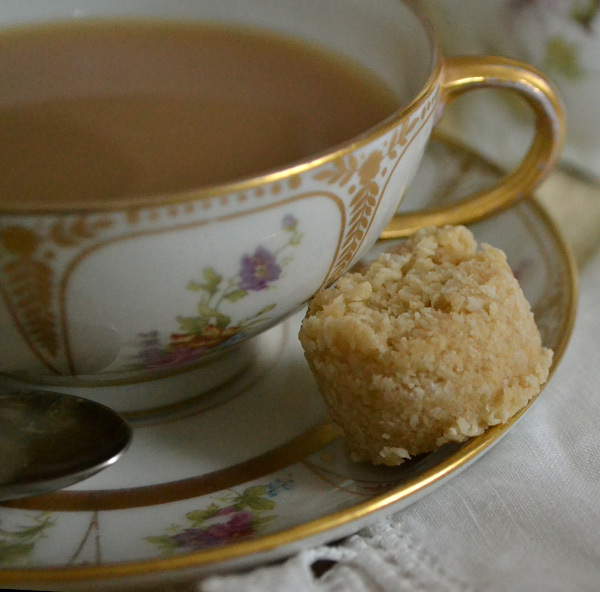 A delicious cup and teapot! And lots of congratulations on having your beautiful book featured in Altered Arts. I'm lucky enough to have one of them from Lenna's swao and know how gorgeous they are!